Kristaps Porzingis first impact with the NBA surely wasn’t an unforgettable one. With six games into the season, the Latvian rookie is on his way to turn many doubters into believers. Porzingis after his Pre-Season debut with the Knicks: 7 points (2/6 FG) in 21′ against Brazilian team Bauru. His positive attitude towards game improvement can easily be seen in the Knicks first two weeks of Regular Season, although the W/L record isn’t exciting. Porzingis NBA debut came against the shorthanded Milwaukee Bucks, who played without their two most promising players (Giannis Antetokounmpo and Jabari Parker). Kristaps’ firsts NBA minutes were a “bust alert”: a couple of soft moves under the boards followed by two missed long jumpers. Despite that, there was room also for optimism: since the first play Porzingis always looked like someone involved in the game and not alienated by that, continually trying to help the team and make the best of his skills, for example by using his body defensively. After his first NBA quarter the music changed: coming back in the court with the Knicks safely up by 11, Porzingis showed a little more of his offensive potential, looking quite comfortable playing as a modern PF, like a young Andrea Bargnani. What differs from today’s Nets player is, most of all, the attitude: Knicks’ rookie is always (and I mean ALWAYS) giving it all on the court, spending all of his energy, perhaps too much of it: as of today, he’s first in the NBA for Personal Fouls with 25, tied by Sacramento Kings’ Greek big man Kosta Koufos. The attitude on the court is crucial, for a young rookie (even more a European one), to gain the trust of his teammates and the respect of the opponents. Under the boards Porzingis is already someone to be taken care of: his ability to grab offensive rebounds (as of today second only to the dominant Andre Drummond of these first two weeks) could represent a huge asset in Knicks’ offense: so far the 2015-16 Knicks are third in the NBA for offensive rebound percentage and first for total ORB, shooting a 6.9% more shots than the last season without significant drops in FG%. Porzingis’ first 10 NBA days were marked by a constant rely on his midrange jump shot, with a poor outcome (37.5%), and by a low 3PT% (21.1%), but there’s room for optimism too. The most challenging of Knicks’ first 6 games for Porzingis was surely last Monday matchup against the San Antonio Spurs and their renovated front court. In my opinion, this was Kristaps best game so far, because he showed off his personality by maintaining his game level at high peaks. For example, creating second chance points with his hustle under the boards. Playing quick Pick-and-Rolls with a smart playmaker like Jose Calderon. Facing a big-man like LaMarcus Aldridge with a perfect defensive position. Providing defensive help on quick backcourt players in different ways with good results. And last (but not least), athleticism and energy on offensive rebounds (with his putback slams becoming a nice cliché). But what is impressing me about the Latvian rookie is his professional personality, not caring about stats but always focused towards team playing and winning. Porzingis after last night game against the Bucks, lose at home despite his second career double-double (14 points and 13 rebounds). It’s too soon to tell if Kristaps Porzingis will become the 2020s Dirk Nowitzki as an amazing and rare combination of height, athleticism and skills, but the first signals are surely encouraging and on its way to disprove Phil Jackson’s summer comments. Regarding Knicks Fans welcoming at an NBA Draft, it is interesting to notice a similarity with another Knicks European Lottery Pick, current Nuggets’ forward Danilo Gallinari. And as it can be seen, revenge is a dish served cold. 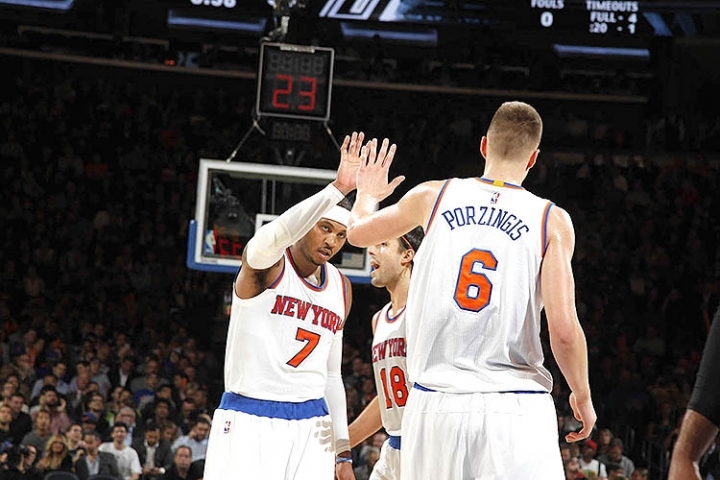 May the Porz be a Force for the Knicks?